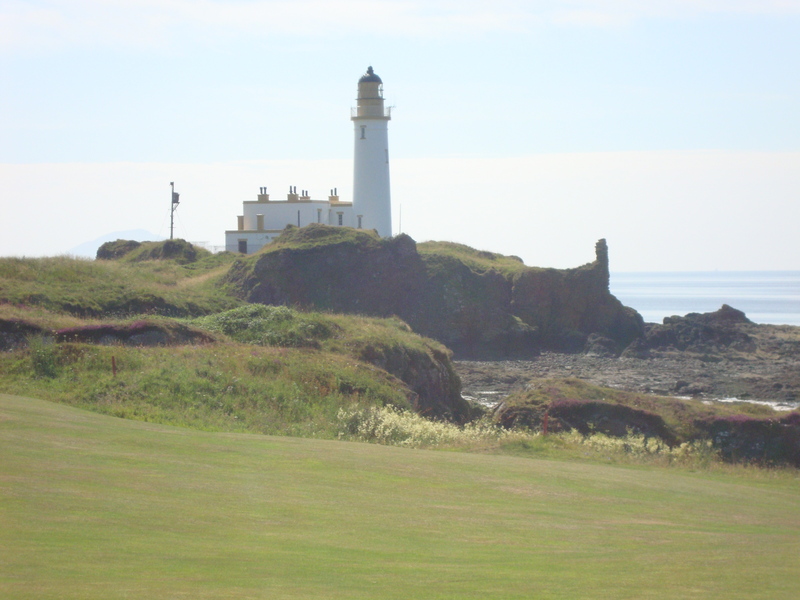 Last week I played golf at Turnberry, Scotland, rated the number one course in the British Isles, and the site of numerous British Opens. Is it really so great? In a word, yes. It was golf nirvana. 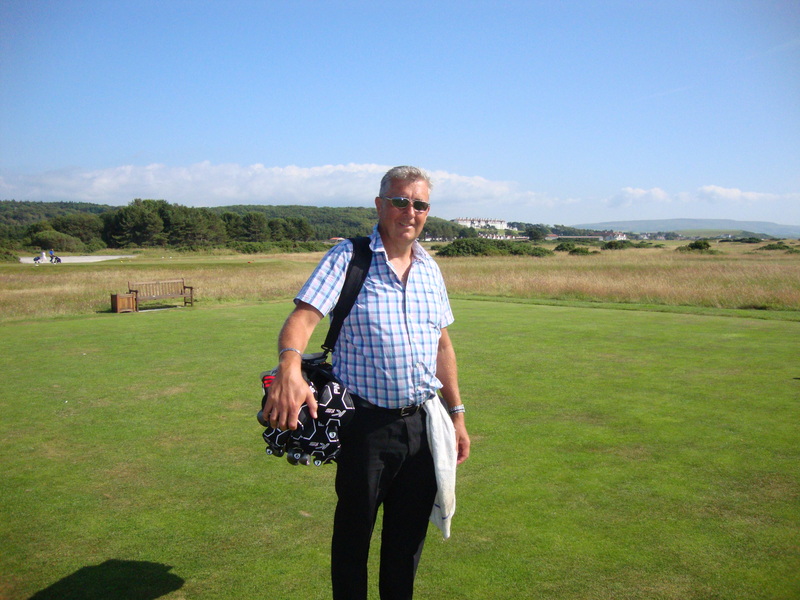 I played the famous Ailsa course the day I arrived, immediately after traveling all night. The day was sunny and mild — possibly too pleasant for a representative experience. At almost every hole, I had a shiver at the beauty. It had a raw, untamed quality, but I gradually realized that it brilliantly combined the natural contours of the terrain with a deep understanding of the essence of golf. Its authors and keepers loved the land, and the game. It demanded constant vigilance and focus. The hazards were, in golfing terms, serious — deep bunkers with walled backs, knee-high grass, spiny gorse, and water. I had one disastrous descent into a bunker, costing four strokes to get out. But I generally controlled the ball well, with a handful of excellent shots. I did not putt particularly well till the end, when I finished with a flourish — sinking a thirty-footer on 18 for a birdy. I ended up with a 92. 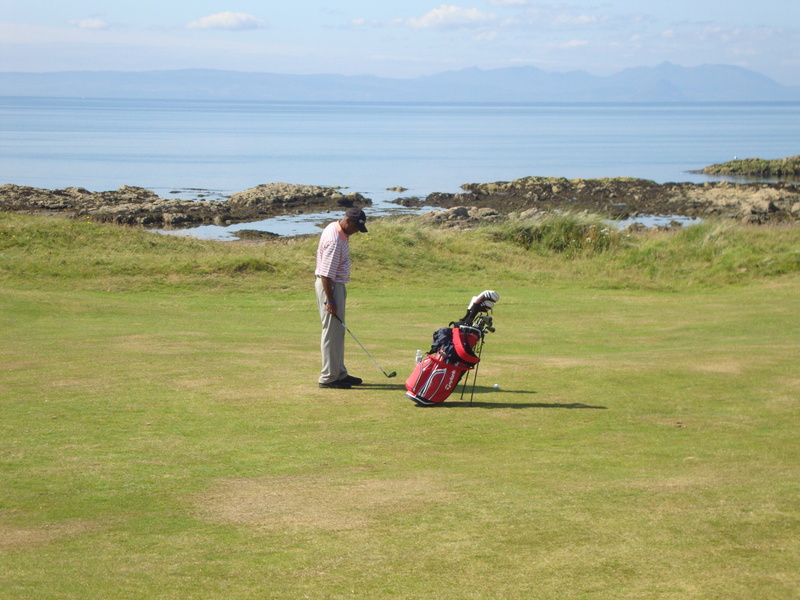 I played the Kintyre course the next day. The skies were overcast, threatening (but never quite delivering) rain, and there were gusty winds — proper Scottish golfing weather. The ocean is a bigger element in this course, and the bunkers less. It seemed less imposing than Ailsa, with views of the surrounding hills and pastures, but the level of difficulty was challenging enough. I played reasonably well for me on the first nine (46), but had a couple of bad blow ups in the second and finished with a 99. There is something about Scotland that spoke to me powerfully. The people seemed friendly, but practical and tough and very proud of their country. The countryside was rolling and rugged. I got a lesson in single malt whiskey, and learned that it a dash of water loosens it up. After finishing my meetings, I had a few hours to walk about in Glasgow, and found it a lively, modern city with Victorian charm. I made a stop at the Gallery of Modern Art to see works of several contemporary artists, and also visited the Kelvingrove Museum. Their collection of Impressionists and Post Impressionists is quite good, and I also liked their collection of 16th century armor. There were lots of people out in Kelvingrove Park, which reminded me of Central Park in New York, but with grass tennis courts and lawn bowling. The trip back was long — about 19 hours all told. It started with a 5 hour delay because of weather in Newark, and the 7 air hours were bumpy. One good word for Continental — they provided surprisingly tasty curry as part of my requested vegetarian meal. I ran out of electricity on both my iPod and iPad, and came close to running out of other reading material (horrors!). The Newark to Raleigh leg was uneventful until near the end, when the pilot suddenly pulled up from the final approach and banked to circle around. My first thought was that I might have a rookie pilot, but he explained that there was a local thunderstorm with microbursts of wind. A few minutes later we made the final approach, and the plane began bucking and shimmying. I focused on deep calming yoga breaths.